A few months ago, a writing friend I met through Twitter recommended a computer program called Scrivener for novel-writing. At her advice, I downloaded a free 30-day trial of Scrivener, which sat on my desktop uninstalled for months. Like my friend, I assumed that anything other than Microsoft Word would just be needlessly tweaky and hard to use. Real writers don’t need flashy programs to write, I thought to myself. But last week, frustrated with juggling several different Word documents, a PDF I was reading for research, and a stack of paper note cards I was using to organize my scenes, I finally decided to give Scrivener a try. I think I owe my writing friend a thank you—and maybe an apology for being such a snob—because Scrivener is amazing. Unlike Microsoft Word, which assumes a linear workflow, Scrivener is designed to handle chaos. Imagine a three-ring binder where you can keep your drafts, notes, research, and scribblings all in one place, rearranging and reorganizing them as you see fit. That’s what Scrivener feels like. Scrivener makes it easy for writers to access all these materials in one place, eliminating the need to flip back and forth between different programs or an impossible array of open documents. Scrivener allows you to split your screen in two, making it easy to compare two different documents or read one document while taking notes in another (this particular feature has been very handy in my work as a freelance editor). You can also drag an audio file, video, image, or PDF into one of the screens—for example, to transcribe an interview or takes notes while watching a documentary. Using Scrivener’s labeling feature, you can “tag” scenes and chapters with keywords. For example, you might tag every chapter in which the story’s villain appears with the keyword “villain.” If you run a search for that keyword, Scrivener will highlight every chapter in which the villain appears—saving you hours of combing through your manuscript if you want to make changes to a certain character or subplot. Scrivener’s full-screen mode blacks out the rest of your desktop for distraction-free writing. This can be surprisingly effective for keeping yourself on-task. Scrivener allows you to drag and drop images, videos, PDFs, audio files, and web content into a research folder, where they are readily viewable (and/or listenable) within Scrivener itself. No more flipping between multiple programs when you’re trying to make notes. Scrivener also makes it easy to keep track of references, which is particularly useful when you’re doing research on the web. Simply drag and drop a website’s URL into the references tab and you’ll never again find yourself scouring your browser history for that elusive site you need to reference in your bibliography. Like any new computer program, Scrivener can seem daunting the first time you use it. Luckily, it comes with an extensive tutorial and user’s manual (both of which saved me hours of frustration and got me happily Scrivening within half an hour). You can download a free 30-day trial of Scrivener 2.1 here. 6 Comments on "Tech for Writers: Scrivener 2.1"
Anything equal on the Windows side of things? 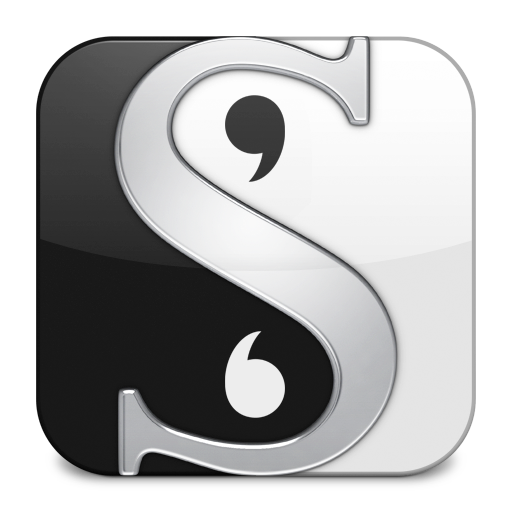 I’ve recently decided to try out Scrivener, so it’s good to hear some other thoughts about it! I particularly like the distinction you make between MS Word and Scrivener. You could basically do the same thing in Word, but as you said you’d have to have multiple documents open and flip back and forth between them. OR you could let Scrivener do all that work for you. I’m also excited to try out the outlining feature. Supposedly a Windows version is due out next month. There is a windows beta which is fantastic.